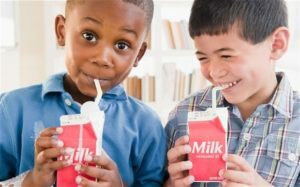 Sipping a cold glass of milk, licking an ice cream cone and nibbling on cheese cubes and crackers are memories associated with my childhood, but did you know that kids are drinking less milk today than in years past? This is concerning because dairy cow’s milk is rich in the nutrients children need to grow and develop. What’s the recommendation? The Academy of Nutrition and Dietetics as well as the American Academy of Pediatrics both recommend cow’s milk to be a staple in the diet of all children. Including two cups of milk for children age 2-3 years old, two and a half cups of milk for children 4-8 years old and three cups of milk a day for children 9 years and older will help them obtain the nutrients and protein they need to build strong bones and muscles. Why aren’t children meeting the recommendation? Many moms are caught in the media frenzy of ditching dairy. Whether they have read about it on their favorite celebrity blog, are on a crazy new diet or are just confused about all the “milk” alternative messages, lots of moms have limited or eliminated dairy from their kitchen. Unfortunately, this misinformation can affect the health of you, your children and family! “Milk” alternatives simply don’t contain the same nutrient profile as real cow’s milk and thus are not an adequate replacement. Sipping on these beverages could mean missing out on a pile of essential nutrients! What are the downfalls of not consuming enough milk? The nutrients in real milk are hard to replace. Milk contains nine essential nutrients and three of the four nutrients of concern that are lacking in most Americans’ diets (calcium, vitamin D and potassium). Calcium and vitamin D work together to build strong bones and missing out on these essential nutrients could mean your child not reaching his/her height potential, an increase in bone stress fractures in adolescence and a greater risk of osteoporosis as an adult. As a mom, how do I include more milk in my child’s day? There are lots of nutrient-rich ways to help your children and family enjoy milk! At breakfast, try whole grain cereal with milk or adding fruit and yogurt to milk and blending a smoothie. Milk can be a great addition to snacks too! Try pouring a cold, creamy glass with an apple and peanut butter, granola bar and nuts or crackers and cheese. At lunch and dinner, milk can be a great hydration choice as it provides 8 grams of high-quality protein per cup! It’s even an option in your child’s school cafeteria so they can enjoy milk at meals 7 days a week! Moms have a hard job, but fueling your family with nutrient-rich foods can be easy and milk is a great way to start! You can feel confident knowing that every sip of real milk your children drink is power-packed with essential nutrients and helping them to grow and develop to their fullest potential! To learn more and find delicious, nutrient-rich recipes, check out milklife.com!